Discover the beauty of the North and South Islands of New Zealand on board Majestic Princess; the newest and most luxurious ship in the Princess fleet. Departing from Sydney you’ll have a stunning introduction to the island as you enjoy scenic cruising in Fjordland National Park, one of the most stunning areas of natural beauty on the planet. Enjoy port calls in the vibrant cities of Dunedin, Wellington and Auckland, as well as some of the islands smaller towns before ending your cruise in the Bay of Islands; an area of beautiful coastline, small islands and lush forests. 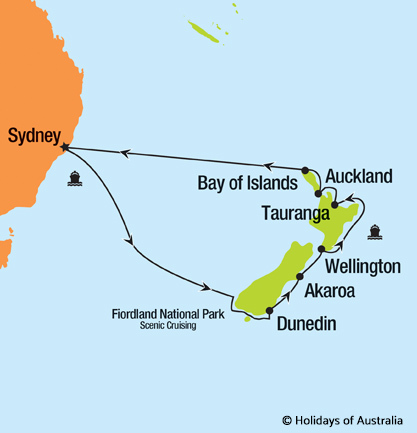 13 nights aboard Majestic Princess cruising from Sydney, Australia to Auckland, New Zealand. Includes all on board meals and entertainment. *Above pricing is based on the arrangements listed under package highlights only. Fill out the information below and we'll contact you with more information.